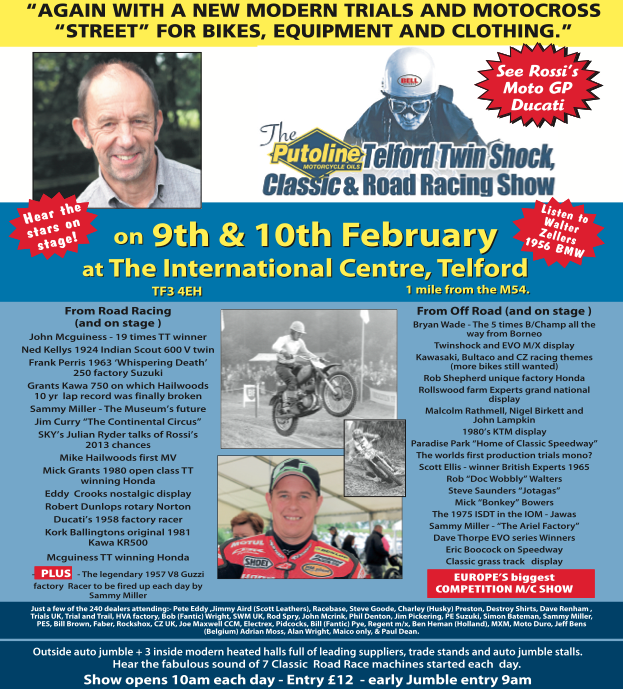 News of a show in Telford this coming February featuring ISDT related memorabilia and bikes – dont miss it especially the following of interest to the history of the ISDT. In 1975 the ISDT was run in the Isle of Man. The 6 man UK trophy team was, for the first time, to ride Jawas supplied by the uk importer Bickers, under the management of Ken Heanes and Chris Oliver. Ken and Gold medallist Dave Smith have now died whilst Ernie Page is now in America but at the Telford show the remaining team members Mick Bowers, Jon May, Dave Jeremiah and John Pease will meet up again for the first time in 3 decades. Dave Bickers will also be there and will be bringing along two of the bikes actually used in the event. Chris Oliver and ISDT legend Arthur Browning will add to the entertainment as the team is interviewed on stage by compere Colin Dommett .